One of the results of building flyovers to ease traffic in our city is that the spaces underneath them are often a kind of wasteland. 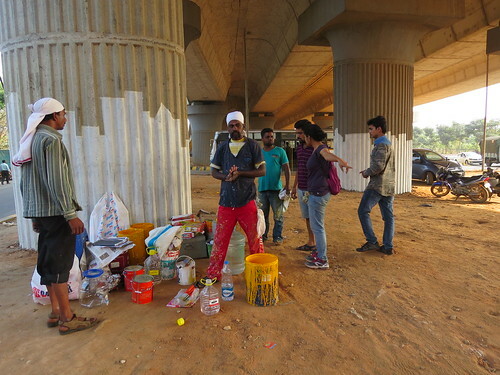 to create art in the spaces under the Hebbal flyover, whereby the common citizen was both represented and asked to participate. 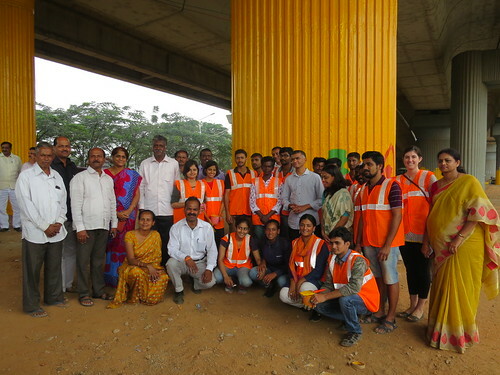 BBMP funded the project as part of a drive to clean up the space before the Karnataka global investors meet. 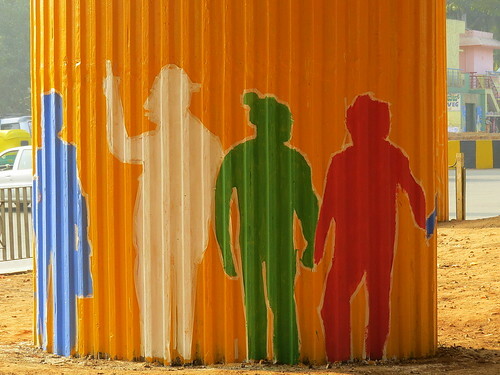 The art project with Jaaga(there was an earlier project at Richmond Circle) was initiated and supported at the behest of JC Sarfraz Khan, by the local councillor. 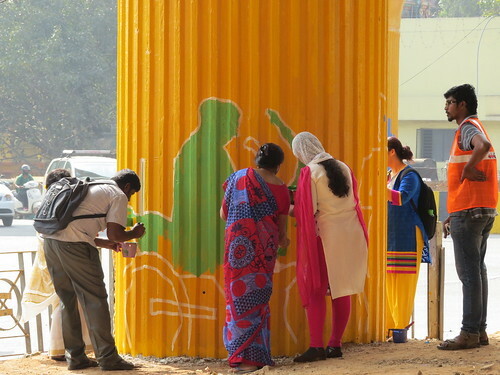 The Bangalore Development Authority (BDA) has taken up completing the painting of all the pillars. 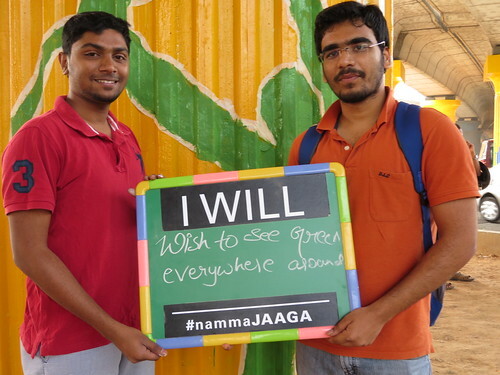 Jaaga had been the facilitators for the art component and for involving community in creative ways to contribute to the art project. 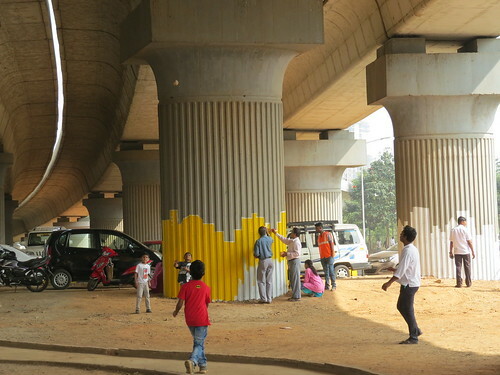 The event consisted of shining lights on citizens of Bangalore, then outlining the shadows cast on the flyover pillars with masking tape, and painting them in various colors. 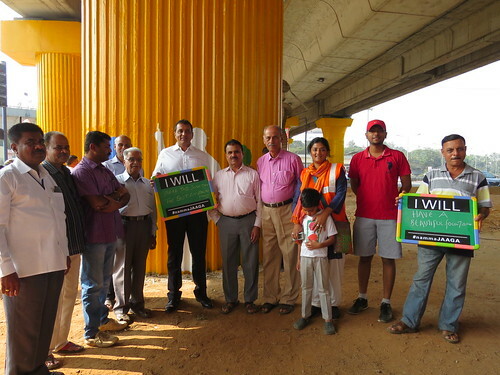 On Tuesday, the 26th of January, 2016, I went to Hebbal flyover to see what would happen. 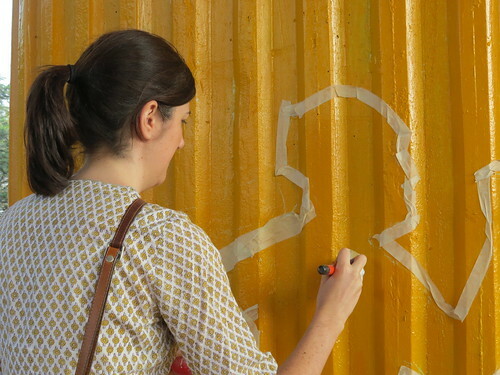 I was completely absorbed by the variety of people who participated in the event, with everyone willingly dipping paintbrushes and going to work on the silhouettes. 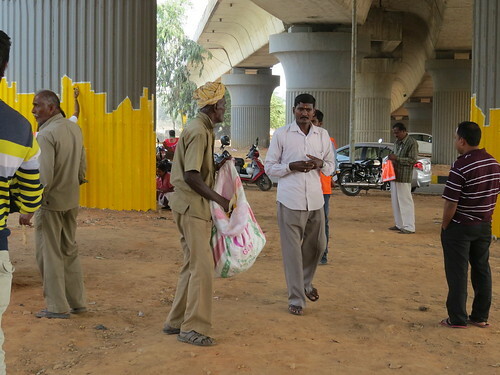 Prakash and Satish are two volunteers, who heard of the initiative through Chithra Kala Parishath (CKP) and came along to help out. 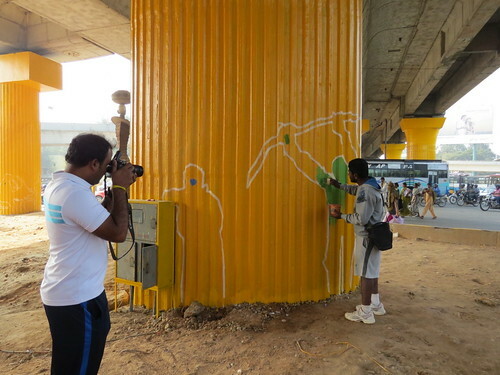 Here are Guru Prasad and Unnikrishna, two more volunteers…one photographing the other painting! 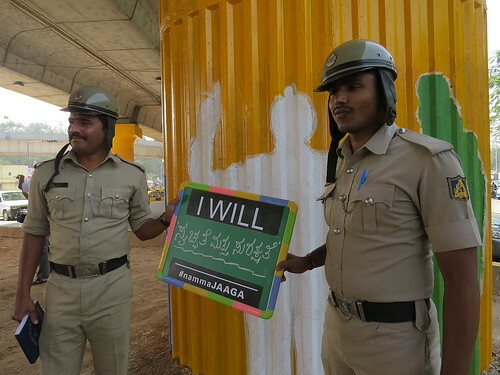 The members of the LGBTQ community, who were “working” the flyover stop lights, were also very keen on participating, and when it came to holding up a slate with suggestions on how to use the space, they enthusiastically provided suggestions, including practical ones like having a toilet and drinking water facilities. 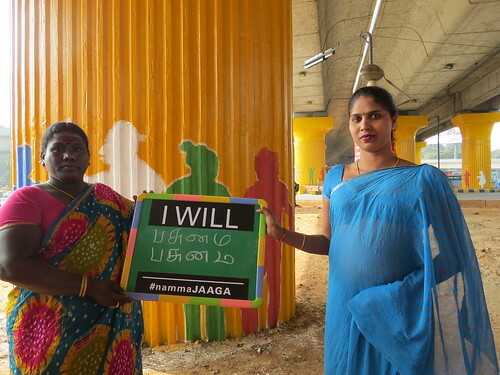 Here are Lalitha and Archana , holding up their suggestions, written in Tamil, asking for greenery. Even the police officers who came to keep an eye on the proceedings became citizens first and policemen later, holding up their suggestions…for cleanliness and safety. 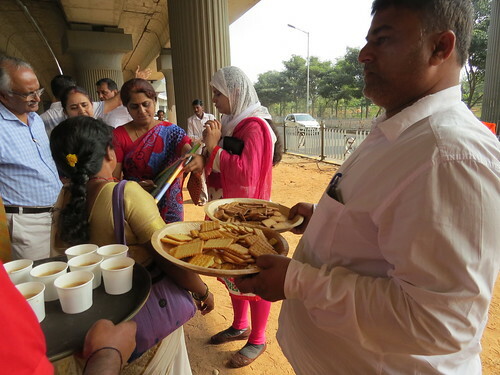 The catering staff from BBMP did a great job of serving coffee, tea and biscuits to everyone. One man who was detailed to up the litter, but several of us helped! Of course, boys always innovate…these young men managed to roll up some masking tape into a ball and proceeded to have fun with it! Many people from the Government were there, too. The Minister of State for Agriculture, Mr Krishna Byre Gowda, with his wife Meena; the Joint Commissioner, BBMP,Mr J C Sarfraz Khan, and the Councillor, Ward 7, Mr Manjunath Babu were all present, as were many members of the Coffee Board, and many pourakramikas from various Wards. 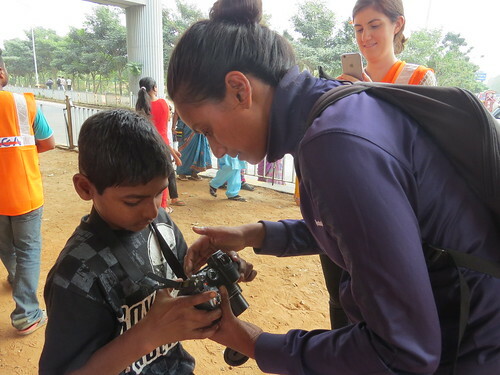 With people like Sarah from New York (a volunteer with Jaaga) added to the mix, and one got a fairly heterogenous collection of Bangalore citizens! 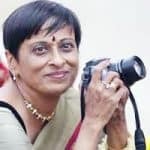 It was a very enjoyable event, though it remains to be seen how the space under the flyover can truly be claimed, when access to it is through heavy, unheeding traffic. The place is also very dusty, and needs a few amenities before citizens can find it usable. What a fantastic initiative. Haven’t been that side in some time. Will definitely keep a look out for the paintings.